We’re less than one month away from Living Lou’s first birthday…did you know the first recipe I ever posted was for sweet potato fries? It seems pretty fitting that today I’m talking about my new, favourite recipe for sweet potato fries. Sweet potato fries remind me of my mom because she loves them as much as I do. 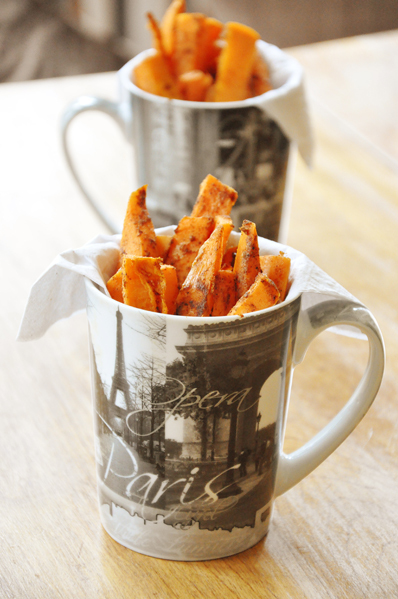 Often when we’re watching one of our favourite shows, I’ll make a batch of sweet potato fries for us to snack on. Not only are they fun to eat (who doesn’t love fries?) but they are really good for you as well. This year we’re watching season 2 of Jamie Oliver’s Food Revolution… and all I’m saying is that I’m so glad that I pack my own lunch. These sweet potato fries are a little spicy, but full of exotic flavors which pair nicely with the sweetness of the potatoes. Not only do these make a great snack but they are a pretty nice side dish with dinner – kids will love them…who doesn’t love fries? * omit the cayenne pepper if you don’t like spicy foods or are making for children. Peel and cut sweet potatoes into desired size. I like to cut mine into thick matchsticks, or the classic french fry shape. Place fries in a large bowl. Combine all the spices, salt and pepper in a bowl. Whisk the two egg whites together and pour over the sweet potatoes. Using your hands to mix around making sure all the potatoes are evenly coated. Pour the spice mixture over top of the sweet potatoes and toss to evenly distribute flavors. On a baking sheet lined with parchment paper, bake sweet potatoes for 20-25 minutes or until fully cooked. What shows are you enjoying? Sweet potato fries are one of my favorite thing! Does the egg white make them crispy? Whenever I bake fries, they always turn out soggier than I would like. @ The Challenged Health Nut - The egg white helps keep them somewhat crispy, although they (unfortunately) never end up being quite as crispy as I wish! And your presentation is adorable, the mugs make them look like haute street food! Nice! These look fabulous. And I'm all about easy dishes too. Well done! Oh good, thank you so much! I found (in my 20s) that garlic and onion powders have their limits (Overdoing them has undesirable effects) and have since used only fresh garlic and onion (whose limits require dramatic tests). I made this recipe, therefore, with 6-10 garlic cloves put through a garlic press and whisked into the egg whites. Being in a hurry, I did not try the same process with onions (but worth a try next time). The result was excellent. Hi Lesley, that's one of the things I love about cooking, everyone can change up a recipe for their own tastes. Thanks for letting me know!